Please see our new Consultation Fee guide for more details. It is practice policy that all accounts are settled in full on the day of your consultation; EFTPOS, Mastercard, Visa and cash accepted. The practice offers Medicare Easyclaim: for eligible services. Your Medicare Rebate is paid back to your DEBIT CARD immediately after you have paid your account at the practice. If you have any difficulties with our fees, please speak to reception. All procedures will incur an out of pocket fee. The cost of procedures caries with the type of procedure and its complexity; please ensure you enquire about any costs prior to the procedure. Please call us on 03 9753 5677 or use our handy online booking service. A standard appointment is 15 minutes. If you require longer than this or need us to see more than one family member, please advise when booking so we can make a longer appointment for you. There may be an extra charge for a long appointment. In the case of acute illness, especially in babies and children, please let our receptionist know when you call. Our practice also provides home visits, hospital and nursing home care. If you would like one of our doctors to visit you at home, please let us know as soon as possible after 8am. Fees of $250 apply for home visits. Please notify the receptionists well in advance if unable to attend an appointment because we can reschedule it for use by another patient. A fee will be charged for failure to attend or cancellation at short notice. We welcome new patients to our clinic. Please call us on 03 9753 5677 to make an appointment or use our online system. Please arrive approximately 10 minutes before your first appointment to fill out our new patient form, alternatively please download it below, fill it out and bring it with you. Our facility is purpose built, and includes disabled access and a play area for children. We also have an accessible bathroom. Our address is 43-45 Adele Avenue, Ferntree Gully. Onsite parking is available. There’s a disabled car space and a ramp at the front of the practice. We know your time is just as important as ours, and we do try to run on time. However General Practice is full of unexpected emergencies and problems which may be more complicated than they first seem. These emergencies and urgent matters can result in unavoidable delays. We hope you understand that if we run late, it’s because we are devoting as much time as necessary, as we would for you. Our friendly receptionists will take your calls and make bookings during opening hours. In the case of an accident or emergency you can call us on 9753 5677 and we will advise you of the best course of action, alternatively please call 000. Doctors can take calls during surgery hours, however our doctors are also seeing patients, and we will not interrupt appointments for calls which are non-urgent. Our receptionists will determine the nature of the call and decide whether to put you through, or take a message. We appreciate your understanding. Please contact the surgery after 10am to obtain test and Xray results. In most cases a follow up appointment will be required, we’ll let you know when you call. You’re responsible for the safekeeping of your Xrays. They’re important to your ongoing medical care and are often required for future appointments both with us and other specialists. If you have had an Xray in the past and not collected it, please ask reception at your next appointment. It’s a legal requirement under the Medicare Act that a referral to a specialist only be given after due consideration by the treating physician. This therefore requires your physical attendance at the practice. If you require an interpreter or translator for your appointment we can arrange one, please let reception staff know when you book. Our practice is committed to preventative care. Our computer system allows us to issue you with reminders via email or text that are appropriate to your care. E.g. PAP smears, annual health checks, immunisations etc. If a doctor has arranged for a repeat prescription to be left at reception an $18 fee will be payable. Occasionally we may have GP registrars and medical students attending the practice and working with our GPs. Please let us know if you would prefer a student or registrar does not attend your appointment. As we are a brand new practice, we are currently working towards obtaining accreditation later this year. If you have a problem or a complaint with our service, staff or practice we would love to hear about it so we can improve your experience in the future. Please feel free to talk to your doctor or our practice manager or put your concerns in writing. 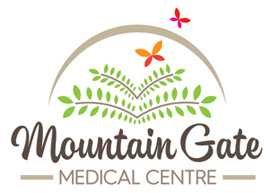 Mountain Gate Medical Centre is committed to maintaining the confidentiality of your personal health information. Your medical record is a confidential document. It is the role of this clinic to provide a caring environment that is safe, welcoming and peaceful for all patients. We respect the rights of individuals, and will attempt at all times to treat patients promptly, courteously and in a way that’s respectful of individual needs. We request that patients, in turn, treat staff and other patients with respect, refraining from shouting, swearing or engaging in other inappropriate behaviour which may cause harm or distress to themselves or others. This medical practice has zero tolerance for abusive and/or threatening behaviour towards our staff and/or doctors.